In a word, the Ace of Swords card represents the truth. The truth can be found out by anyone by logic, rationality and detached observation. We cannot always access the divine love of the Ace of Cups, and we do not always have a way to summon the fiery burst of courage of the Ace of Wands, but we do always have an opportunity to figure out the facts, or formulate a plan. The Ace of Swords symbolizes that opportunity. You may need to be highly rational in solving your problem. Get objective. You may have an increase in your mental or intellectual powers at this time, or you may have a sudden epiphany or revelation about the deeper meaning of a situation that you face. You may feel aligned with a higher or divine mind, as you receive ideas, concepts and understandings from a source beyond yourself, almost like you are “downloading” knowledge from the universe directly. The Sword pierces a crown, which on the one hand symbolizes the exalted faculties of the higher mind, and on the other hand symbolizes the ability of the mind to cut through the ephemeral, material and incidental and bring out the essential or eternal. The Sword of the mind is able to “cut away the fat” and understand the basic, fundamental facts of a situation. The soft comfort of the subjective world of Cups is absent here; the cold hard facts of reality are the domain of the Swords suit, and the Ace of Swords indicates one who is masterful at separating the truth from falsehood, the essential from the incidental, and the important from the unimportant. Sometimes it is possible to comprehend the truth clearly and judge impartially without stress or struggle, as when you have an excellent teacher who illumines a field of inquiry for you, or when you simply have mastery of a given topic, or easy comfort with facing reality. Other times, however, knowledge, clarity, objectivity and acceptance of the truth only come after a long, difficult and painful fight, and this pain and suffering is of course a primary aspect of this suit, being that the Sword is primarily a weapon that cuts, pierces, bludgeons and even kills. Sometimes we must have the truth beaten into us before we will come around and accept it; we may even gather our own weapons around us and try to combat the Sword of truth on the offense. Yet the truth is inflexible as a Sword and will make us bow to it before it will bow to our will. The Ace of Swords may indicate a cold, hard dose of reality of this kind, or it may simply be advising a highly rational, discerning, objective approach. The Ace of Swords card is connected to Mercury / Mars as a symbol of a sharp mind and decisiveness, or Mercury / Jupiter as the growth of knowledge and higher mind. The Ace of Swords card can represent your thoughts, belief systems, and the mental energy for creating new beginnings. You may soon experience a breakthrough in communication if you are brave and trust your own judgement over that of anyone who is trying to advise you. When the Ace of Swords card is reversed, it can indicate that your ideas, memory, or concentration might be blocked. You might find it difficult to express yourself or get your point across when you communicate with others. You may need to beware of lies or betrayal, and take great care to only speak from truth and justice or your words may be used against you. The Ace of Swords card can represent changes in your work life. You might be using new tactics in your job or choosing to leave your current job for a new opportunity. If you are content in your current work, then now might be a good time for you to share your good ideas for new policies or procedures. Even if you don’t receive instant credit, you may soon get the appreciation and rewards you deserve. The Ace of Swords can represent new beginnings or changes in your romantic life. If you are in a committed relationship, you may be ready to change some aspect of your relationship. You should feel confident speaking your mind and being truthful even if it may bring an end to your relationship. If it does, you may have a new relationship on the horizon that is much better for you. 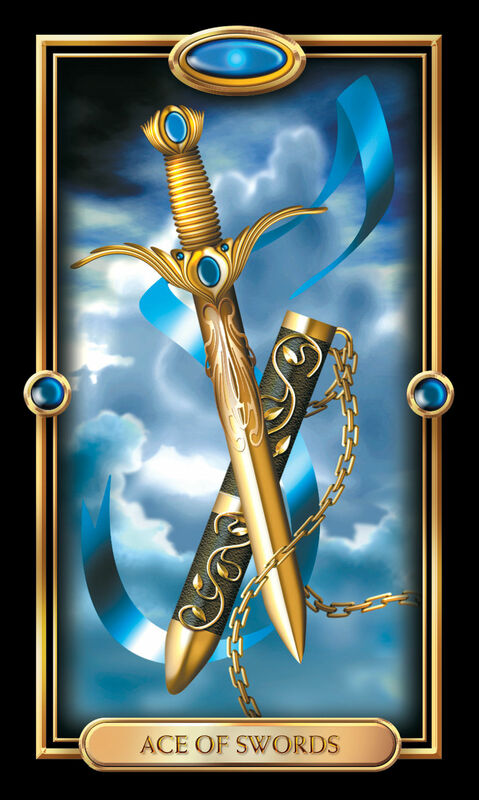 The Ace of Swords card indicates a time of caution in your spending or financial life. Now is not a good time to take changes with your money or invest any funds you could not afford to lose. You may be approached for a loan soon, but it may not be in your best interest to let anyone borrow money as it could result in a damaged relationship. The Ace of Swords card can signify a time of letting go of the things that are no longer working for you in your spiritual life. You may discover that you’ve been hanging onto viewpoints or beliefs that do not serve your growth. Be patient and seek the insight of others, and you may soon find some spiritual truths that are more promising and beneficial in your life.